Comments The measure of all things luxurious, the color of passion, what adds the ‘flaming’ attribute to the red! It is the gorgeous rubies – a gemstone like none other. Featured today is a natural, unheated ruby from Mozambique of 1.08 carats set in 22-karat gold as a Sun talisman. 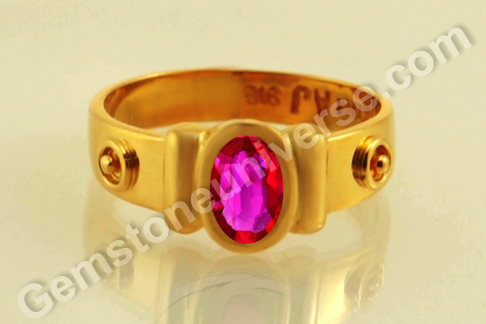 The oval shaped gem as a deep vibrant reddish pink color and has great clarity. Note that the symbol of the Sun sits in relief on the shanks. It is said of rubies and sapphires, especially that these gems need not have size in order to be precious. A good ruby or a sapphire, by virtue of it’s color and clarity can be prized. And with the market situation of rubies – natural and unheated becoming increasingly rare, it is a worthwhile investment in itself as the value of rubies has steadily increased by significant measure, even in the last 3 years. According to Vedic Astrology, natural ruby or manik gemstone is the gem of Sun or Surya and worn in gold it can be used as a talisman to harness energy of the King of Planets. Ruby is an intense gemstone and the fire and energy even in a small gemstone (but of course which is completely natural and treatment free) is phenomenal. Comments What is the epitome of planetary gem therapy? It is when you use the best of flawless gemstones to tap into the reservoir of divine energies, which are in harmony with your own, to achieve the best results and to make life an enriching and pleasant experience. Featured today is an exceptional talisman. It is a fantastic natural Ceylon Yellow Sapphire of 4.55 carats set in 22-karat yellow gold as a Jupiter Ring. The cushion cut unheated yellow sapphire from Srilanka has a fantastic jyotish weight and has an appealing golden butter yellow color with excellent clarity. Natural Yellow sapphire or Pukhraj is the gemstone of Jupiter / guru/ brihaspati, The talisman is extra special in that this is a Planetary bhasma ring. 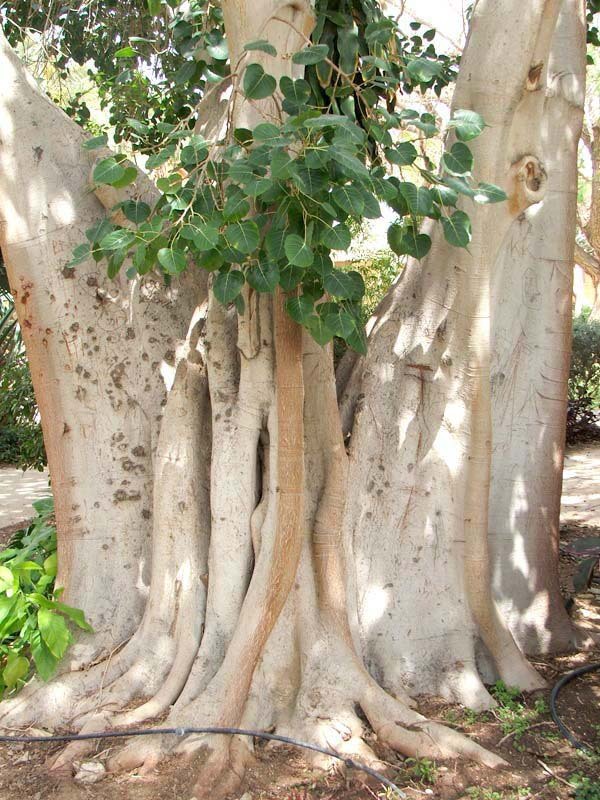 At the side of the gem, note that there are two tubular channels that have been filled and sealed with the sacred herbal ash of Jupiter’s planetary herb – Ashwath better known as peepal or ficus religiosa. Note that the talisman combines the powers of Jupiter’s gem and its sacred bhasma. Note that the symbol of Jupiter stands in relief on the shanks of the ring. 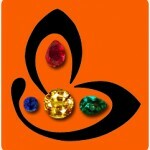 Overall, it is a complete Jupiter talisman and promises great results with regard to planetary gem therapy. Some where deep down in our hearts we have a speculation that Ruskin’s words were inspired by the Sapphire – royal, majestic and so powerful! 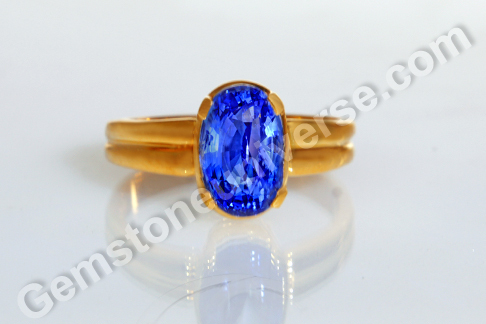 Featured today is a natural Ceylon Blue Sapphire of carats, set in 22 karat gold as a Saturn Talisman ring. This Oval shaped Blue sapphire from Sri Lanka with a fantastic jyotish weight of 4.49 carats is fully natural and treatment free. The gem with excellent clarity possesses the coveted Silky cornflower blue color – a rich, delightful color that inspires much more than just poetry. Natural Blue sapphire of neelam gemstone is the gemstone of planet Saturn/ Shanidev and is used to harness his saatvik, transformative energies. And when there is a blue sapphire in question, there are hundreds of myths and legends surrounding the gem! It would be worthwhile to point that the great story of Dushyanta and Shakuntala has a Blue Sapphire playing the pivotal role in it. After King Dushyanta has secretly married Shakuntala he started on his way back to his kingdom but before leaving he gave her a blue sapphire ring and promised that he would come back to get her. Shakuntala, lovelorn waited endlessly for the king to return and on one such day as she sat reminiscing about the time spent with the King, she forgot to pay respects to Durvasa rishi, who temper was known far and wide. He cursed her that the person whose thoughts she was engrossed in would forget her. When the sage got to know her story, his rage subsided and he said that the king would remember Shakuntala if she showed him a token/ gift of remembrance. 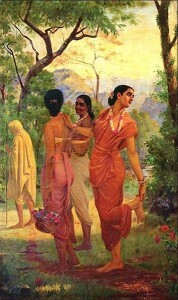 Shakuntala thought of the ring and set about to meet the king. However, as fate would have it, while in a boat she ran her hands through the sparkling waters and the ring slipped from her fingers to be swallowed by a fish. Without the ring, she met a very indifferent king who failed to recognise her. Dejected she returned to the forests, where the legendary King Bharat was born to her. Later after a couple of years had gone by a fisherman turned up at the palace with a brilliant blue sapphire ring that he had found in the stomach of a fish he had caught. King Dushyanta was immediately reminded of Shakuntala and finally went on to find his forgotten wife and son and bring them back to his kingdom. Comments The vintage appeal of the hessonite garnet its biggest draw. No wonder you will invariably be able to find this gem (of varying grades of course) as an integral part of the jewellery that was owned by generations before you in the family! 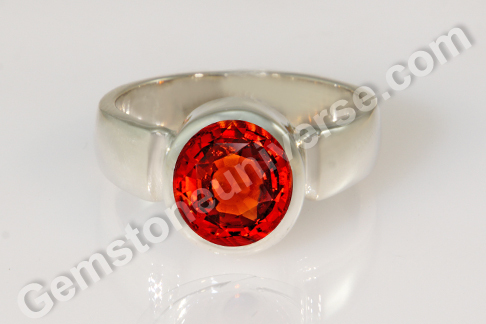 Featured today is a top quality jyotish grade Hessonite garnet of 5.30 carats set in sterling silver as a Rahu Talisman ring. The round shaped hessonite from Srilanka has a lovely deep burnt orangish cinnamon color and is fully natural and free of treatment. Hessonite is also known as Gomedh or gomedhaka in Hindi and is regarded as the gem of Rahu in Vedic Astrology. Set in a talisman this gem brings much relief from the typical problems associated with this karmic planet and begets gains if Rahu happens to be placed favourably in an individual’s birth chart. Rahu is the North Node of the Moon and since it is a point on the Moon, the mind gets affected first, during its planetary periods or if It occupies certain positions in the chart. Wearing a natural hessonite brings about a fair degree of stability in life and tangible positive improvement in quality of life in such cases. Comments Who says that your Gemstone talisman has to be plain vanilla? The gemstone is such a powerful end and a means in itself that you can just weave a design around it to tell a story! Nothing vanilla-ish about it at all. You can have a staid, classic, timeless piece or you can bring on the bling factor by adding a design element or two. Featured today is a beautiful, pear-shaped natural Colombian emerald of 1.79 carats set in sterling silver as a mercury talisman ring. The masterfully fashioned gem has an early summer grass green color and has excellent clarity too. The gemstone of Mercury/ Budh, this natural emerald/ panna stone is resonating with saatvik energies and quite powerful. It makes our day not only when we land top of the line jyotish gems but more than that gems as patrons themselves who actually understand gems and whose love for these delightful treasures of nature comes across clearly. This talisman has been crafted for a patron who already owned an emerald (of course from Gemstoneuniverse) but could not resist the call of this natural treatment free beauty with exceptional color and clarity! It’s definitely a win-win situation as not only does it work for planetary gem therapy and is a good investment option but it is also a thing of beauty that will be a source of joy forever. Comments The connoisseur who really understands gems and their power de facto stands apart. It is the choice made that vouches for this fact.Validating this fact is the gem featured today – a Stunning Natural Imperial Golden Yellow Topaz of 5.84 carats set in 22-karat gold as a Jupiter Talisman ring. The flawless natural beauty from the Ouro Preto mining belt in Brazil is completely treatment free. 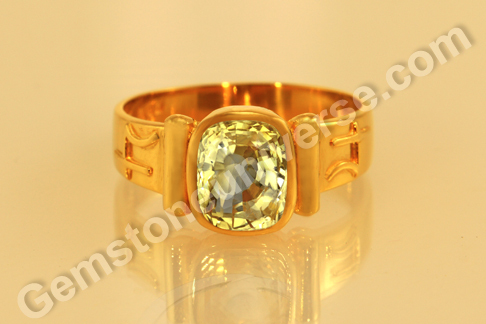 The Imperial golden yellow topaz is super lustrous and has excellent clarity. The connoisseur has chosen to fittingly have the gem set in 22 karat gold and that has worked wonders – accentuating the beauty of the emerald cut gem . The gem is a part of the new lot Regalia 2012 available online. Read more about this lot by clicking here. 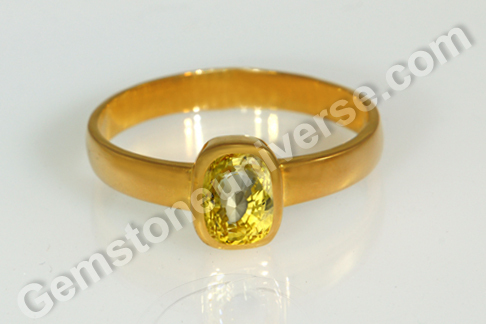 Imperial golden yellow topaz is the substitute gem for natural Yellow sapphire or pukhraj stone. It is the gemstone of Jupiter / Guru/ Brihaspati and is use to harness his benevolent energies. A buyer must be wary and must verify origin and genuineness of the gemstone. Often citrine (and that too treated in some manner) is palmed off to the unsuspecting buyer and that is not capable of giving jyotish results. To read more about this click here. Comments All that is put in word is the un uttered song of creation. Especially when it goes on to describe the breathtaking beauty that has workings of the primordial force within it. 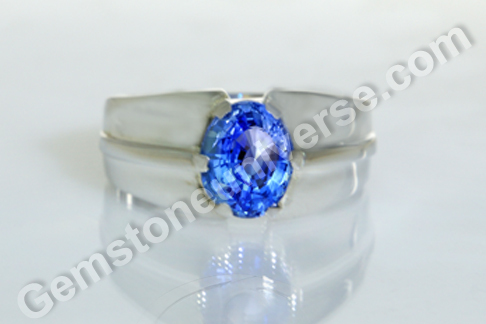 Featured today is an enchanting natural Ceylon Blue sapphire of 3. 66 carats set in sterling silver as a Saturn Talisman ring. This unheated blue sapphire has a vibrant sky blue color and excellent clarity. 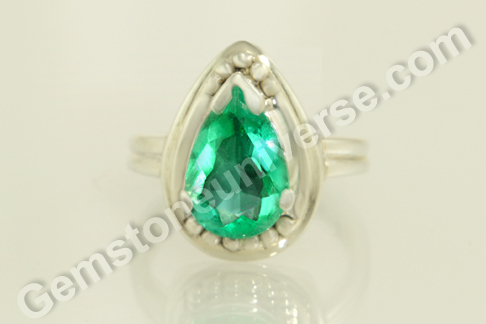 The oval shaped gem has good jyotish weight and is a good piece for planetary gem therapy. To bring her joy and peace of mind. Blue sapphire has been long used by ancients for metaphysical properties and was widely believed to be a protective stone as well as one that could cure excessive heat in the body and venom related troubles. Comments It is only a connoisseur that can tell a true treasure from a milieu of gems! Although there each gem is a veritable miracle in its own right, there are some that truly command awe! Featured today is a splendid natural white sapphire from Srilanka with a weight of 4.15 carat. 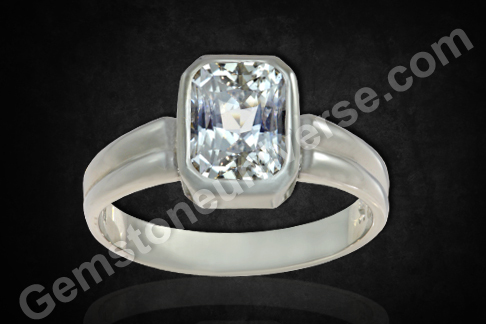 The fabulous gem is a radiant rectangle cut and is a flawless, colorless beauty with fantastic clarity and brilliance. The gem with a fantastic weight has been set in 18-karat white gold as a Venus Talisman. White sapphire is colorless corundum – found extremely rare in nature. A white sapphire of over 2 carats is actually hard to find and therefore will command a premium just by the virtue of its caratage. Also known as safed pukhraj or naram vajramani in Hindi, the white sapphire is the gemstone of Venus/ Shukra. Venus is the planet that has all things luxurious, fine, rich, aesthetic and sensual in its domain. A well-placed Venus in one’s birth chart can bestow all earthly successes and delights to an individual. Although Diamond is also the gemstone of Venus, finding a jyotish grade flawless diamond is quite a task. A white sapphire is a much better option (although rarer and quite dear) because its clarity can be judged easily compared to that of a diamond. Also because the female individuals can don the gem, white sapphire without worrying about any strictures (Vedic Astrology and ratna shastras would rather have the female individuals keeping their distance from diamonds – their touted best friends!). Comments Molten gold is the color of richness, of boundless fortunes and flourish. It is a color that cannot symbolize anything else but splendor! It can be associated with auspiciousness, opulence and opportunities. Featured today is a fine gem – a natural and unheated Ceylon Yellow sapphire of 2.02 carats set in 22-karat gold as a Jupiter ring. 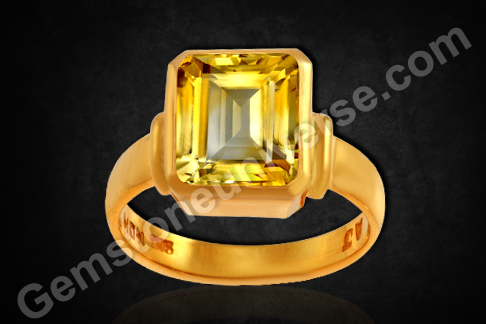 The cushion cut gem is beautifully faceted and has a rich canary yellow color. What really sets this gem apart is the fantastic clarity that enhances the natural adamantine brilliance. Yellow Sapphire or Pukhraj is the gemstone of Jupiter / Brihaspati/ Guru and when used in a talisman can be used to harness its energies. The yellow sapphire is an excellent healing stone too. Aside of its well-known effects – namely heralding good fortune, helping in bringing to fruition ones ambitions and increasing the powers of intellect and wisdom, it helps the physical health by eliminating the toxins. Ceylon Sapphires or the sapphires from Sri Lanka are by far the best but a buyer must always ensure that the gems have are unheated / treatment free, if the purpose is for use in Planetary Gem Therapy. 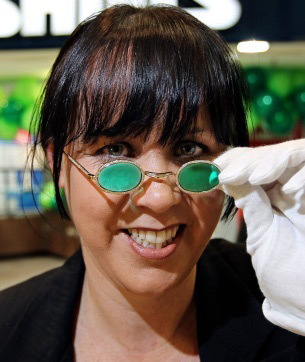 Comments The fascinating green gem, that bears an innate richness and a promise of greener fortunes. The proof that nature can produce a verdant lushness within its womb and not just on the surface! Featured today is a treatment free natural Colombian emerald of 2.04 carats set in 22-karat gold as a Mercury talisman ring. The Classic emerald step cut gem has a pleasing deep grass green color with great clarity. One has to only be ever so slightly sensitive to pure unadulterated energies to feel the resonating Mercury energies that are abundant in this gem. 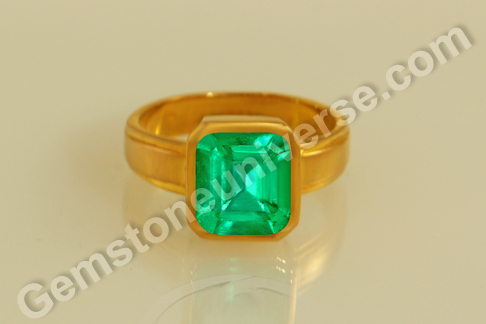 Natural emerald or panna gemstone is the gem of planet Budh/ Mercury. It is also known as ‘markata’ in Sanskrit an has its origin in the Latin word smaragdus . Here’s a legend associated with the emeralds – In Ancient Rome, Nero supposedly watched gladiator fights through a large transparent emerald as he found the color to be calming. Talk about watching blood sport and pandering to need for feeling calm at the same time. But then, that was Royalty.